Faltplatte is a Berlin-based company that makes paper models of your very own favorite buildings from the former East Berlin. 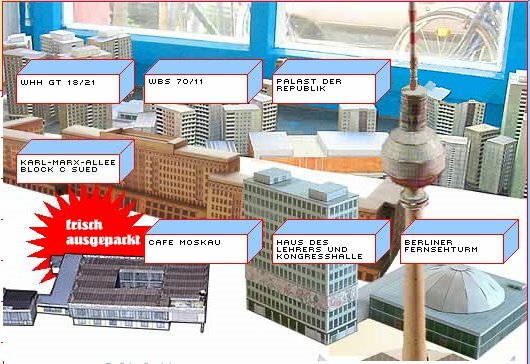 Just punch out the pattern from the paper backing, and you too can build your own Plattenbau, Cafe Moskau, Karl-Marx-Allee, and even a building from West Berlin -- Erich Mendelssohn's Schaubühne. These models take me back, reminding me of the myriad paper cut-out models of ships and planes from my youth. I was really psyched about this and got my own miniature Palast der Republik. Problem is, it's so cool as a flat thing that I haven't put it together yet.